Hey all! I've just finished beating the game again (or at least getting to the last boss with everything collected), so I thought I'd weigh in on the changes. First and foremost, the new camera is wonderful. I utterly love it. There are a few tiny kinks to work out without a doubt, but overall it improves the game so much. I never hated the old camera setting like a lot of other people did, but switching to the new manual setting easily showed me how inferior the old was. The game feels better to control all around because of it. With that said, I want to point out that the "Camera behind you when entering new rooms" thing is only partially true. When you enter the room, you still see YL facing you coming through the door, and afterwards the camera quickly shoots to behind them. This is ok in most cases... but in some it is incredibly disorienting, and even has some obvious bugs. As for the game itself getting changes, I feel mostly positive on them. Kartos now has a visual indicator of when he can or can't shoot and/or dash, based on his jaw or wheels going red. I think I might still have preferred a simple bar gauge or something... but it is still much better than before when you had no idea. And points to Playtonic for giving us the info without cluttering up the screen! Black Hole in One has been given walls all around the course, so it is practically impossible for the ball to fall off. Given how much time the mini game gives you, I was a bit put off by this change. Now it is disturbingly easy to beat. But I guess lots of people struggled here so... ok? The pagie near the end where you slide down the electric-gate-filled passages wasn't notably easier... yet I managed to beat it in only 3 tries, so I figure they must have done something to it. The Gloomy Gem Grotto is now much easier than before, with at least 3/5 of the paths being walkable rather then requiring the Reptile Roll. Not only this, but all "dark" areas in the game have been made brighter, so the whole section is much easier than it was. As for Rextro... thank goodness they fixed him. The games aren't anymore fun than before, but lots of irritating elements, or flat out broken glitches, have been removed. In Kartos Karting, the large Corplets that hit you are gone. In Hurdle Hijinx, you can actually get to the end without using some very strong language after several attempts! And tiny changes have been done throughout as well, such as Up n' Nova getting a smaller collision box for YL. There are a few other miscellaneous changes that are good or bad. Good: Kartos is now accessible in world 1's expansion WITHOUT the need for Slurp State. He has been moved to being directly before the vents that once blocked him off. Unfortunately, the move is a bit disjointed in that the track near him spits out into the air in a really obvious "we just stuck this here quick" way. I hope they smooth out how that looks later on. There are the signs in Hivory Towers pointing you to the book worlds now, which I feel mostly ambivalent towards. On one hand, it certainly helps newer players, but on the other it kills some of the exploration. My biggest problem is that the signs use the Grand Tomes' individual symbols, meaning Galleon Galaxy is revealed as a space world long before you reach it. I think they ought to reconsider this, and just put the world "number" in place of its symbol. Overall, I think Playtonic has done some good here. I intend to open up a thread for things we still would really like to see, in addition to bugs I've found so far. The camera alone really helps the game, and while some changes are questionable, I get why some of the challenge was toned down (although toning down Galleon Galaxy's mini-game when it's the last world doesn't make much sense to me...). For those of you who have tried the game out, what were your thoughts? Well, so much for looking forward to the update. I'll stick with the old version ; it's not like Yooka-Laylee was the hardest game to begin with and I was actually upset that it had so few sections that actually dared to challenge the player. And now for those sections to be nerfed? Why not remove the health meter and make the duo invincible while they're at it. But then, I bet I'll probably be boo-ed and told that "IF YOU WANT A CHALLENGE, GO PLAY DARK SOULS". Nah I felt the same way too in many instances. Black Hole in One really surprises me... That never took me more than two times to beat, and that was only because the first time I'd just zip through it without being careful at all. Arguably, world 4's golf course is now harder than world 5's, which is just backwards. Gloomy Gem Grotto also goes a bit too far in my opinion... but at least that one is arguably "earlier" in the game. I just don't understand the changes to things in world 5. They did make the Rextro game Glaciators more difficult, but not enough so to create meaningful challenge. As for making the other Rextro games easier, I certainly believe some of them needed it. But - taking Kartos Karting as an example - the game could have kept certain difficult elements so long as they just adjusted other parameters that helped it feel more fair, like a slightly longer invincibility after getting hurt, or giving you some kind of timer to know when the flamethrowers change. In Up n' Nova, I would have been happy if the bounces you do were just slightly smaller so that the game would emphasize skill a bit more over getting lucky: while the collision change is ok, it does make dying a lot harder to do than before. Of all the things I don't mind seeing made easier, Rextro does top the list, so I don't mind too much here. But other elements of the game go a bit too far in my opinion. I'm definitely seeing a "make it easier" versus "make it fair and fun" approach going on. Perhaps a knee jerk response to the many (unjustified, IMO) complaints towards the game at launch? Given that most reviewers were using the underperforming console versions, I really feel that Playtonic shouldn't consider what they say as much. Most people (including myself) just don't like frustratingly difficult minigames (at least when they are mandatory to fully complete the game). It's one thing for the main gameplay to be difficult, but with minigames you're forced to master an entirely new gameplay style with a small amount of gameplay (that you may or may not actually like) and so a high difficultly level usually makes it more obnoxious than fun. Minigames are meant to act as a little breather from the main action once in awhile. They don't need to be difficult to serve that purpose. I was excited about the updates until hearing they nerfed things. Fixing bugs is great, quality of life improvements are great. However YL is a very easy game overall and there were like 2-3 remotely challenging things and they made them all easier? Must every single game be dumb downed and streamlined? And we're talking about 100% related things here. Anyone can beat the game, these aren't things that are mandatory to do. Must EVERY SINGLE THING IN THE ENTIRE GAME be easy? 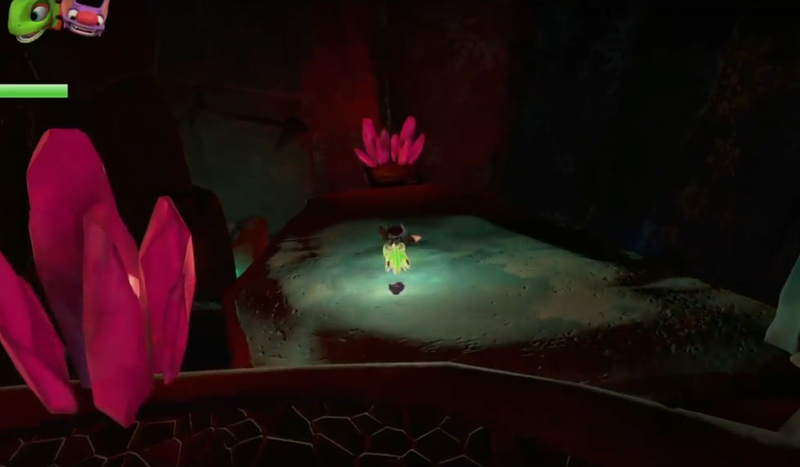 I'm very glad I got to play through YL at release and experience Gloomy Gem Grotto and the Black Hole in one content at they were intended to be. It's amazing how many things they fixed/improved and how close they paid attention to the complaints people had. I personally won't replay the game before the remaining stretch goals have been met (64 bit shader mode, orchestrated soundtrack, developer walkthrough, free DLC, YL rap inside the game) but this will help to leave future players of the Switch version (and those who still haven't gotten into the other versions) with a better impression. I had been really really vocal about my hate for Gloomy Gem Grotto but even I think that simply making most of its paths walkable was the wrong approach... That way you might rush through the cave and wonder where the actual challenge was. In my opinion most parts of the cave just needed a few attempts of trial and error to get used to them and weren't much of a big deal afterwards. What really bothered me and caused me to waste almost 3 hours of my life were 2 sections that were so wacky that no matter how often I tried I couldn't get used to them. Yeah, staying in control of reptile roll on those slippery slopes was really hard but I eventually got the hang of it. What really drove me nuts, though, was the fact that the jump button very often wouldn't respond while rolling over the snow and I would steer straight into the abyss. So this is one of 2 sections where an improved ground geometry is very welcome. Slowly reptile rolling towards a moving platform near the end of the cave where you really didn't want to start all over again was insane. I ended up double jumping + flapping to reach it instead of rolling down. Having a slightly bigger platform might have helped. Gloomy Gem Grotto certainly could have used a change for how much apparent trouble people had, but they went to far IMO. I think that they simply could have made the glowing ability more impressive: reveal more area, so you're less likely to fall off. Now that they have made the darkness so bright, there is literally no need for Slurp State in there. And while I understand the frustration of failing when you get close to the end, I still think they could have found creative ways around it, like after crossing each section maybe there is a switch to activate a nice bridge to that part or something. I didn't watch too many reviews for the game, but I did see Gamexplain rip apart Gloomy Gem Grotto, and I can't help but feel like it's partly their fault for how much Playtonic changed it. But then Black Hole in One... why? You can easily complete this challenge in 60% of the time they give you, and without any kind of worry about hitting the ball off the edge. I think I maybe saw one comment on this forum about that challenge being too hard, and that's it. There were elements of challenge that did need to be brought down, such as the slide at the end of the game, and Rextro's horrible (and in one hated case, bugged) mini games. But the other things? I'd also like to point out that with how many times I've played the game, it's gotten difficult to know what exactly was changed to be easier, and what I've just gotten better at. For example, I'm not sure if Nimble races were made easier, or if the maze in world 3 was toned down a slight bit with how fast the walls move. Can you guys imagine if Banjo could have been patched back in the day? Rusty Bucket Bay's engine room would probably be completely static! It's a video game. Losing/dying/failing is part of a video game. A game you can't lose is a game where winning is meaningless. I don't just want to mindlessly mash buttons and progress through the game. There's supposed to be parts that challenge you and that you have to do over and over, getting better, to pass. The thrill of beating an area that's been giving you trouble is one of the best parts about gaming. If there's no challenge at all, the game is not a game anymore. You may as well just watch a movie. "Collectathons" always got a bad rap as being mindless, but there was lots of hidden challenge in acquiring all the items. However YL was probably the easiest "collectathon" I ever played and they took like the 2-3 areas that were even semi-interesting and retro fitted them for 5 year olds? LAME AS HELL. If there's no challenge then it truly is just a mindless collectathon and not fun at all, just tedium. If these super easy games are the type Playtonic wants to make, so be it, but I won't be buying them in the future unless there's some substance to them. Overall it is a very nice update with a great amount of bug fixes. However I just took a look at Gloomy Gem Grotto to see the changes for myself, and unfortunately the changes there do seem to have gone too far. There's just no challenge to that section at all after the update. Except for the couple of small remaining sections of ice, I literally walked and jumped through the whole thing calmly and never once had to use the glow-in-the-dark power (I hadn't actually even unlocked the Slurp State move). Everything in there is fully visible now, and the few remaining ice sections are even more visible with how much light they are reflecting now. 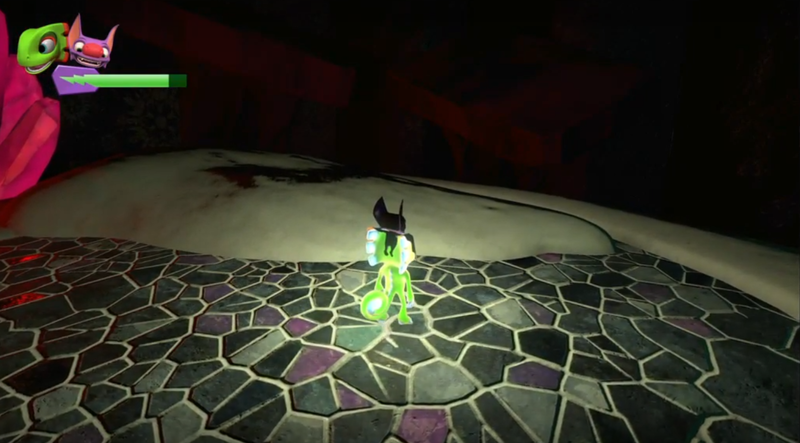 I do hope that in a future update Playtonic will restore at least part of the challenge to Gloomy Gem Grotto. At least make it as dark as it used to be, including the remaining icy sections. There's just no point to having the glowing powerups in that section at all currently. Or have an option in the menu to play the more challenging version in the game?